FOCUS: Unitech Scientific serves the Wine / fermentation industry. We manufacture enzymatic reagents in Southern California and ship direct throughout North America; we also have regional US & International Distributors. Unitech Scientific offers wine analyzers, microbiology and other key products. SYSTEMS: We take a systems approach to marketing and technical support, for example providing reagent kits, standards, analyzers, and applications for automation. We have earned a reputation for excellence in customer and technical support. REAGENT KITS: A complete line of enzymatic reagent kits to assess the fermentation, vinification processes: Glu/Fru, L-Malic, Acetic, Free & Total Sulfites, phenolics and nutrient status. SERVICE: We have a small dedicated team of knowledgeable professionals who look forward to working with you. Unitech Scientific’s customer focus is expressed in our quality products & literature, attentive customer service & on-line ordering, expert technical support, and on-site Preventive Maintenance and training programs. Unitech Scientific's ChemWell for Wine autoanalyzer offers random access automation with continuous sample loading. ChemWell performs the assays, prints reports for customized requirements and frees the technician for less routine tasks. Several assay protocols can be run simultaneously, up to 96 samples at a time. Turn-key applications for the Unitech line of reagents (see our reagents section), with flexible, open software for custom assays. Difference:ChemWell automates enzymatic and EIA assays and is efficient and inexpensive to operate. It performs 10 times more tests per kit vs. manual, automatically washes cuvettes and offers several calibration options. Unitech offers our famous, responsive technical service. 4. Unitech Scientific V120 Spectrophotometer– our NEW, most cost-effective ($1550) instrument: improve your wine quality and significantly save on outside testing costs. Use any of the 30 reagent kits from Unitech Scientific; simply dial-in the wavelength and start your assay. User’s manual, dust cover, power cord and 1-year warranty are included. OurSartorius 100-Monitors make microbial concentration easy, reliable and affordable. Plus, the Sartorius line includes 17 types of traditional food & beverage media in convenient ampulized and ready-to-reconstitute dry disk formats; e.g. the Differential WL media provides the traditional Wallerstein-cycloheximide media for bacteria/Brett assessment. The multi-parameter autotitrator has 9 wine applications. Unitech offfers free installation and training and a choice of dissolved oxygen meters, providing wine bottle oxygen checks for every budget. Step by step photometric wine analysis procedure unitechscientific.com. 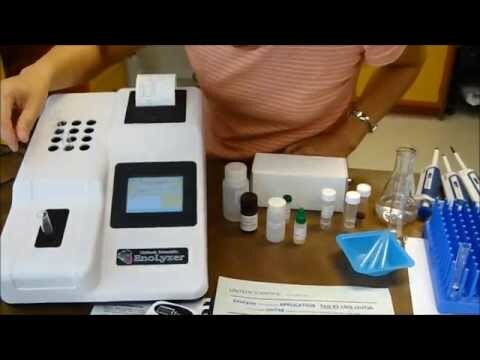 Product demonstration of EnoLyzer wine analyzer testing wine or Total Sulfite. Includes pipetting techniques. Winemaking is both creative and demanding. Great wine requires the right team ready with the right tools. Among the challenges, you need to anticipate and react quickly to signs of wine spoilage. Here is how Unitech Scientific's new Wine Micro 2-hour test can improve wine quality & save money! Are you spending $800 or more each year on outside testing? Replace your old spec, or let us help you gear-up for in-house testing. Reliable wine results – fast! Unitech V-120 is perfect upgrade for your old spectrophotometer, an easy solution to expensive outside lab results. Improve your winery efficiency, broaden your test menu for this harvest and beyond. Measure Glucose/Fructose, Malic Acid, Acetic Acid, Ammonia, NOPA, Sulfites and more. The power of a broad test menu with a single system! The low initial investment and low operating costs. The accuracy of enzymatic testing – the state-of-the-art wine industry method. The touch screen interface, PC data Capture option available. Prepare reagents & cuvettes and complete your test per reagent kit instructions. Contact us to discuss options and supplies: sample tubes, adjustable pipettors, cuvettes, etc. Request a quote, or order today. Look to Unitech for superior quality, fast delivery and excellent technical service. For more information contact us at info@UnitechScientific.com or (562) 924-5150. 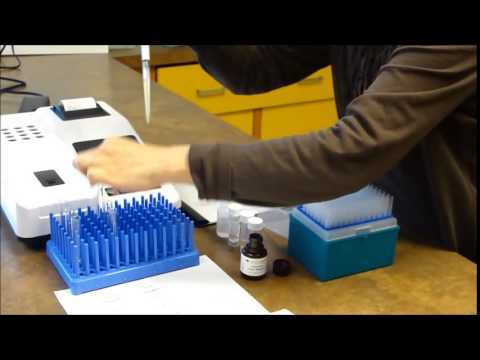 Watch the product demonstration of EnoLyzer wine analyzer testing wine or Total Sulfite, including pipetting techniques. Unitech Scientific, the California-based developer of wine-testing kits, announces a new 2017 Harvest Discount on EnoLyzers: Reliable wine test results in your winemaker’s hands fast, and now at lower price. EnoLyzer, the semi-automated wine analyzer, is the perfect upgrade for your old spec. and the easy solution to expensive wine lab results. Improving your winery efficiency for the 2017 harvest and beyond. The EnoLyzer uses the spectrophotometer technology and the same Unitech Scientific reagent kits that the wine industry has enjoyed since 1996. Unitech’s enzymatic tests measure GF, Malic Acid, Acetic Acid, Ammonia, NOPA, Sulfites and more wine components routinely monitored during harvest & vinification. · The power of a broad test menu – test over 25 wine components with a single system! · The low initial investment and low operating costs. · Touch screen technology, stored protocols, on-board printer & PC data Capture option. From the RUN TEST menu, simply Select your test, prepare your reagents and cuvettes per on-screen prompts. Unitech is proud to distribute the ChemWell autoanalyzer worldwide to the food and wine industries. We have developed ChemWell wine analysis applications for many of our reagents. Have a look at our analyzer and our systems approach to wine testing. ChemWell is an "open" system, i.e. it can use either all Unitech reagents or your current enzymatic reagents. 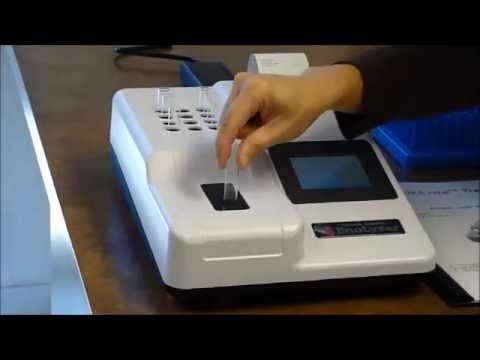 Uniquely among chemistry analyzers, ChemWell is able to run ELISA assays (in coated micro-strips). We currently offer Histamine ELISA & Ochratoxin A ELISA. Our ChemWell analyzers have automatic custom filters permitting analysis of wine tests in addition to the typical 340nm analysis used for most enzymatic tests. And ChemWell uses very little reagent, so you can drop your reagent costs to about 1/10 of what you currently spend. Unitech Scientific has developed a Cost Justification worksheet that gives some structure to the process of calculating the reagent savings (7 times the tests from each reagent kit) and labor savings that your laboratory would expect by adding a ChemWell autoanalyzer. *Compatible with Windows 10, 7, Vista and XP. Contact us if you would like this worksheet, or a quote. ChemWell-T for WineTM a fully automated wine analyzer designed for lower throughput winery labs EnoLyzer, the semi-automated affordable alternative to a spectrophotometer. What is ChemWell-T for Wine? ChemWell-T for WineTM is a fully automated, random access wine analyzer for Biochemistry and lmmuno-Turbidimetric assays, designed specifically for lower throughput labs, specialty labs, and to serve as a dependable backup analyzer. Performs Biochemistry and Turbidimetric assays.